Since I love the concept of spaghetti squash more than I like spaghetti squash itself, I was scouring the internet for anything that inspired me. Then it hit me…what about a marriage of the imposter ‘spaghetti’ with actual spaghetti – well, brown rice spaghetti to make it gluten free and give it a healthy boost. The best part? This recipe has half the starch of a delicious pasta dinner, yet all of the satisfaction. DIRECTIONS: Pour 1/4 cup olive oil into a small saucepan. Add 2 cloves of smashed garlic and 1/2 tsp red chile flakes. Slowly heat oil until garlic starts to brown. Remove from heat and strain to remove the chiles and garlic (you’ll have more than the recipe requires – store it in the fridge). 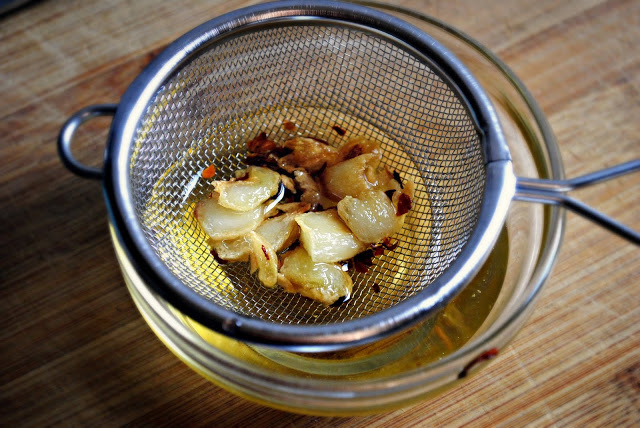 Add 3 tablespoons of infused oil and lemon zest to a large bowl. Add brown rice pasta and toss. 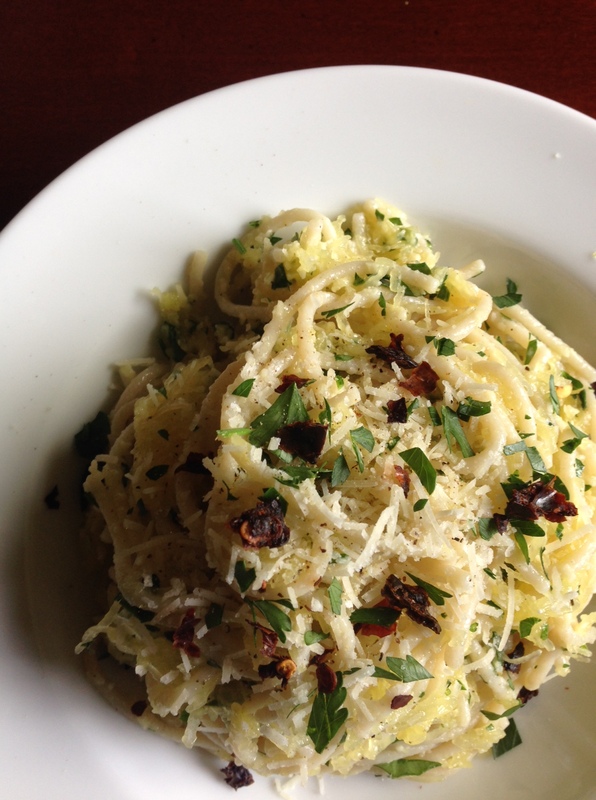 Add spaghetti squash and toss again. Throw in Parmigiano-Reggiano, parsley, salt and pepper. Toss to combine. Taste for seasoning and add more salt and pepper as needed. Serve warm or room temperature; top with a little more cheese, parsley, a few red chile flakes and cracked black pepper. Drizzle with a little more infused olive oil, if desired. Enjoy! 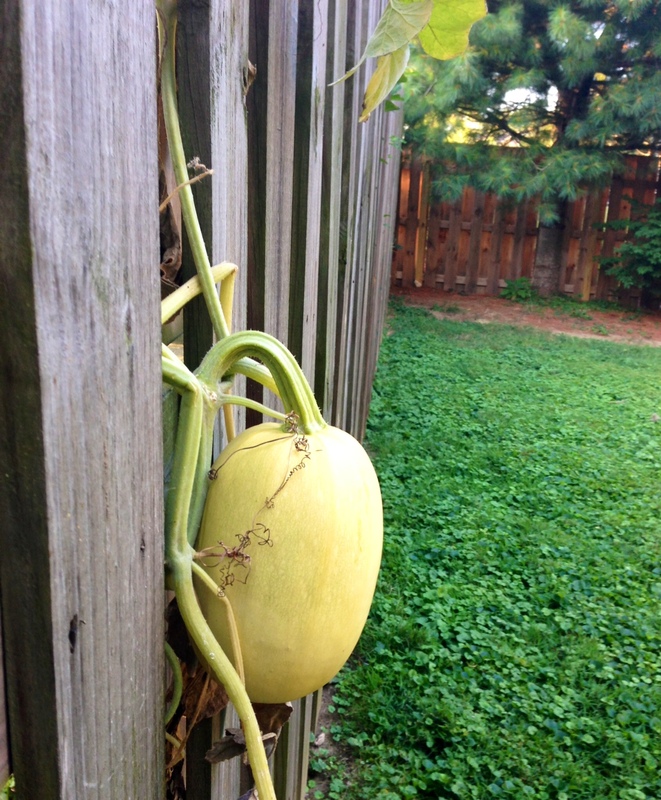 COOKING SPAGHETTI SQUASH: There are a couple ways to cook a spaghetti squash. Usually I roast it in the oven (instructions can be found at the bottom of THIS PAGE >). 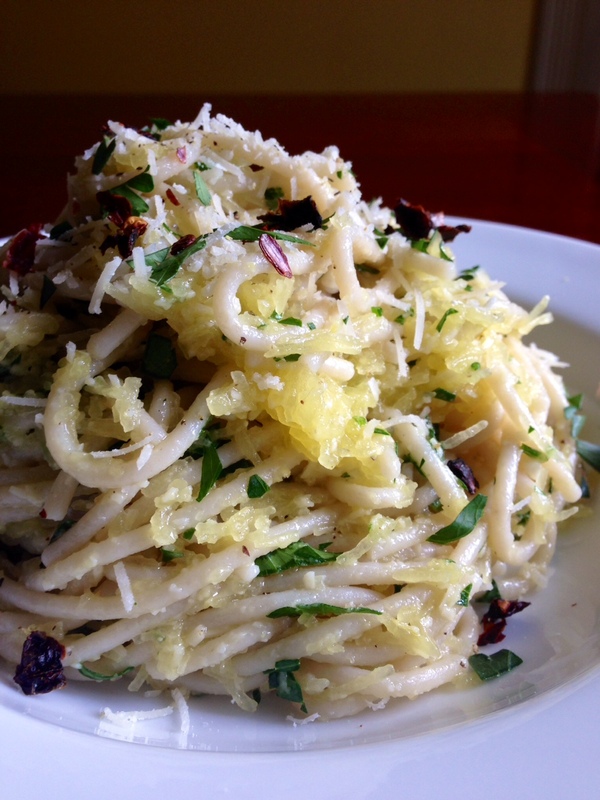 But for this recipe, I prefer no color at all, and want the squash to remain a little al dente. The fastest means to an end is the microwave. (I almost never use the microwave, but for this, I make an exception.) *Carefully* stab a few holes in the squash with a chef’s knife so the steam can escape. Put the squash in a glass dish and microwave uncovered for 8-10 minutes. Let it rest for 15 minutes or so. Slice the squash in half the long way, scoop out the seeds and then using a folk, scrape out the strands of warm, delicious squash. If you’ve never worked with it before, you find a video tutorial on YouTube.